Thanks for joining us for Canadian Rawk Week! 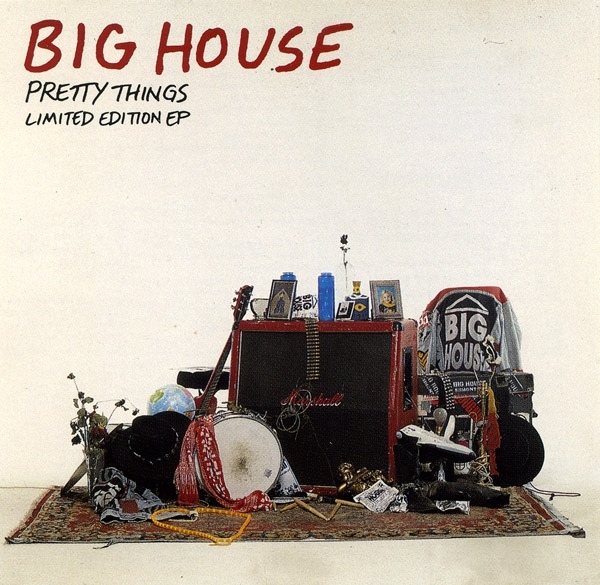 BIG HOUSE – Big House (1991 BMG) Not to be confused with the country band also called Big House. Big House hit the ground running out of Edmonton, Alberta in 1991, but it was hard to take them seriously at the time. The hair and headbands were pretty silly, and they had annoying song titles such as “Refuse 2 Run” and “Nothing Comes 4 Free”. I acknowledged they had a pretty cool single “Dollar in My Pocket (Pretty Things)”. This was lifted from a prior EP called Pretty Things, very hard to find. They also claimed to be former punk rockers. Drummer Sjor (pronounced Shore) Throndson once stated that the band used to have mohawks when they were teenagers, but shaved them off and had a change of musical direction. With that, the silly hair and the dumb name, it was pretty easy to ignore Big House. Then a co-worker at the Record Store named Kam talked me into listening to it. The year was 2005 and my feelings quickly turned from indifference to delight. Big House, for all their flaws, were actually pretty good! Every song on this album has swagger. It doesn’t sound like a debut album at all, and perhaps that’s due to the experience of having done a prior EP. The band, and singer Jan Ek in particular, make this sound like a second or third album. The first chunk of the CD was top-loaded with singles. “All Nite” was a minor hit, a Motley-Poison mixture of rock thrills. Generic, but with that knack for melody once again, not to mention the leathery lungs of Jan Ek. Those two factors elevate the song beyond the morass of crap swimming in the seas of cheese in 1991. Another decent rocker, the Kiss-like “Refuse 2 Run” stays the course before you’re up for the next single, the ballad “Baby Doll”. Generic acoustic sentimental tacky stuff is this, but why do I like it? Maybe that quiet moaning slide guitar? Sounds a lot like Cinderella. Truthfully it’s not bad, but it’s really not that different from any of a hundred ballads. Thankfully “Can’t Cry Anymore” has some noisy guitar and plenty of attitude, especially in the punk rock blowout ending. Once again, it’s remarkable what a handle Big House had on writing great rock melodies. 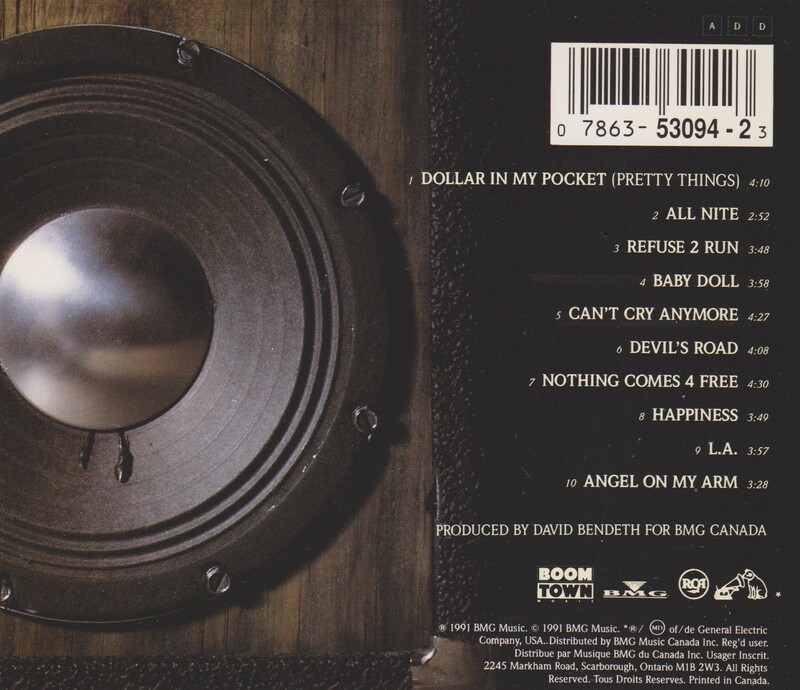 “Can’t Cry Anymore” is one of many on this disc. “Devil’s Road” sounds like the opening of a second side, and a strong opening it is. “So make the music faster, for the spells we’re castin'” sings Jan Ek on the fine choruses. None of these songs are particularly fast, but they all rock in one way or another. For example “Nothing Comes 4 Free” is slow, but has a menacing vibe and the requisite hooks on the chorus. The closest they get to filler is “Happiness” but even that is not bad. It’s an unusual cross of pop melody with classic rock guitars — Cheap Trick meets Kiss, perhaps? Final track “Angel on My Arm” is a celebratory tough little rocker, but the penultimate track “L.A.” is my favourite of them all. It seems Mr. Ek’s girl has left to go to L.A. and a be big movie star, and isn’t coming back. But then Jan gets a long distance call from L.A. It seems she mis-dialed and got Jan when she expected to get “Jack”. He responds incredulously, “Jack who?! Jack Palance? Jack Nicholson? Jack…Jack who? !” It’s great fun! Listen to that bouncy bass. That’s pop punk, baby. So are those unabashed “la-la-la-la” pop hooks. Just a killer, instantly likeable fun song is this. “I been drinkin’ with every damn girl in town,” sings Ek after the disappointing phone call. “If I seem a bit too forlorn, I’ve been loving her too long.” People, I’m serious: This song is a triumph of songwriting and execution. You are free to disagree, but all I know is that I have played this song on repeat countless times. In fact I’m doing it now. I’m already on spin #3 for this session. Silly name and album cover aside, I suppose it all works as a package. It’s no wonder the band never made it big with a cover this horrible; imagine my shock when I saw that it was done by none other than Hugh Syme, master of many Rush records. And this faceless cover conceals within it one of the best hard rock albums of the era. Sadly that era died before Big House could make a second album, but let’s celebrate that we have this one. Just like we are glad for the first two Skid Row albums, or New Jersey by Bon Jovi, I’m happy now to have Big House in my, err, house. Please welcome Sebastien to Getting More Tale. Seb is a Sausagefester who also happens to play drums, produce, and own a recording studio. Today we discuss the new Star Wars: The Force Awakens trailer, Taylor Swift, Avril Lavigne, and modern music. I’m not a Weezer hater, but I definitely have said that their best days were behind them in the past. The first two records (particularly the second) were great. The third had some good stuff on it, but they really lost me on the fourth. This new one Everything Will Be Alright in the End is their first with Ric Ocasek producing since Green (2001) and the first single “Back to the Shack” seems to proclaim that Weezer want to return to their indy garage rock roots. I do love the lyric, “Let’s turn up the radio, Let’s turn off those stupid singing shows.” Weezer and I may not always see eye to eye, but that’s something we agree on. Leader Rivers Cuomo wrote the opening song “Ain’t Got Nobody” himself, but on at least half the album he is sharing co-writing credits. It tricks you at first into thinking it’s a new Linkin Park single by it’s heavy guitar and keyboard riff, but the vocal is unmistakably Weezer. I find the lyrics annoying: “Ain’t got nobody to kiss and hug me?” Come on Rivers, put on some balls and let’s rock. The song straddles a line between pop-punk and 80’s rock, something overdone in my opinion. The aforementioned single “Back to the Shack” is second up, but something about it annoys me. I think it’s the simple repetitive nature of the song. It is catchy, admittedly, but I don’t know if it’ll have much longevity. “We belong in the rock world,” sings Rivers, but he hasn’t proved it to me yet. “Eulogy for a Rock Band” sounds like a 90’s song, so if going back to the shack was Weezer’s quest, I think they succeeded. I don’t think too much of this song. I like when the vocals homage the classic rock n’ roll of the 1950’s, but that’s about it. It’s indy pop sticky taffy with loud n’ proud drums, but it ain’t my cup o’ java. Something of the edge that Weezer had back in ’94 is missing here, though I’ll be damned if I can put my finger on it. “Lonely Girl” on the other hand is awesome. It has a real toughness and drive that the other songs so far had been missing. Though the caveman guitar solo is extraneous, the song is a keeper! Justin Hawkins of the Darkness co-wrote “I’ve Had it Up to Here” with Rivers, and you can absolutely hear that. Rivers’ falsetto echos Justin’s. It sounds in fact that Rivers is singing along to a Justin guide vocal, so obvious is the influence. This Weezer-meets-Darkness track is another keeper. Maybe The Darkness should record it for their new record, too. Then “The British are Coming” starts with swampy acoustics, before it turns rock. I didn’t like the song to start, but it grew on me fast. It has a genuine epic rock quality, like a Styx song. I like the guitar solo a lot. But something I dislike about Weezer is their tendency to glue catchy, rocking choruses to goofy soft pop bits, like on “Da Vinci”. I don’t think the choruses can make up for the limp verses. I like the guitars on “Go Away”, which sounds like a natural “side two” opener. Appropriate since we’re halfway through. This 50’s homage is a duet with Bethany Cosentino, and it’s absolutely awesome. “Cleopatra” is an expected country rock jaunt and another standout. Then it transforms into Weezer-metal with a suitably Maiden-inspired guitar solo. Great song. “Foolish Father” is strong, and then it’s into a three part “Futurescope Trilogy”. This too is excellent, with shimmery anthemic guitars to start with on “The Waste Land”. “Anonymous” is the stuff that rock operas are made of. I like when bands dig out their Queen albums for inspiration. This mini-suite ends the album on a stellar note, leaving me with a hankering for more. That’s a good way to end an album. Too bad it didn’t start like it finished. When we last checked in on this old Canadian indi band, it was on the 1994 EP So This is Limbo, which I rated a 2.75/5. I haven’t played Tangible Vibe, the full length followup, in quite a few years. I remember liking it back in 1996, when hard rock was all but dead and we were forced to seek out other kinds of rock music. Will I still like it now? “Another Low” is a pretty simple pop punk track, not the kind of thing I usually listen to. It’s fast with heavy guitars and poppy vocals. What stands in for a guitar solo is a simple melody. It’s more annoying than likable. “Frustrated” is more entertaining, taking the tempo back to a radio-ready pace. Seems that I still like this one! You’d be forgiven for thinking it’s a new single by Sum 41. Hopefully you’ll forgive me for liking it. Back then we didn’t call this stuff “pop-punk”, we called it “alt-rock”. I recall liking “Living Proof” which sounds very much like Green Day. It’s still a catchy little tune, that just it needs identity. There’s certainly no reason it couldn’t have been a hit. On the other hand, I remember not caring too much for “Headtrip”. Its seemingly pro-drug message didn’t appeal to me and I didn’t think the song had much individuality going for it. My feelings haven’t changed too much although I do appreciate the great vocal performance and guitars, but it could have been half as long. Then and now, I love the title track “Tangible Vibe”. Almost Monkees-like, it’s a soft rocker with a heavier chorus. I really like the recurring guitar melody. Maybe I shouldn’t say Monkees-like, when I have heard Weezer do songs similar to this. It’s a standout and now that I have re-discovered it, I plan on playing it a lot more. Equally good is “Kill Me Slowly” which again is firmly in pop-punk territory, with vocal harmonies. As back in 1996, “Mary” bores me. It feels like it’s a repeat of ideas from previous songs. Such is the problem with these simple melodies. Sure they’re catchy, but you run the risk of ideas that sound too similar. There’s nothing wrong with it, but we’ve heard it before. “Amore di Gatto” (“Love Cat”?) is a beautiful classical guitar intro to the dark song “Circus”. This song has more in common with Deadline’s early hard rock roots than modern pop rock. It’s mournful with with the strong melodies still intact, and a tricky guitar solo to boot. It has the most emotion on on the album, and remains its best song. “I Don’t Even Like You” is fast and fun; the drums are played with brushes and the guitars are acoustic. It’s one of the shortest songs, which good because novelty songs are best kept short. “Friend In Me” was the “hit”, and it’s the exact same version as on the So This is Limbo EP, which is great. Closer “Go With the Flow” is another Green Day copycat, unfortunately. It’s the early, heavier side of Green Day, but still the comparisons are unavoidable. Shame. A really great EP could have been made from the best songs on this album. Review dedicated to Scott the Skeptic. Ahh, the 90’s, how I do not miss thee. When I think of the 90’s, I remember how bands I liked simplified things to fit in better with the new alt-rock hordes. Guys like Deadline initially showed a lot of promise. They combined diverse elements and showed potential for future growth. Then they cut down the guitar solos and streamlined everything to its melodic basics. I like So This is Limbo, (a five song EP) but it is safe to say that I do not like it as much as their self-titled debut. Its five songs all fit into a soundalike form. The first two (“Friend in Me” and “Going With a Smile”) are so similar that they both feature harmonica parts as one of the hooks, bouncy basslines, and a simple guitar melody where a solo would go. That’s not to say they’re bad songs. They’re good for what they are: happy-go-lucky 90’s pop rock. “Friend in Me” got a bit of airplay at the time, and it’s the best song here. The second best is “Going With a Smile”. “Laundry Day” is a little darker, but “You know it’s laundry day again,” isn’t the kind of chorus that really gets my angst out. This one has a guitar solo too, and it’s a gooder. Too bad that the song isn’t as good as the solo. The pop-punk of “Darkest Hour” is better. Why did singers always use distortion on their voices in the early 90’s? It’s too bad. “Darkest Hour” isn’t bad at all. The last song is the dreary “Better Things to Do”, which kind of leaves the EP on a downer note. It’s too bad really because I know they can do better. They did do better, on the Deadline EP. Would they redeem it on the Tangible Vibe album? I remember liking it back then, but I haven’t played it in a long time. That’s the next review. As for So This is Limbo?